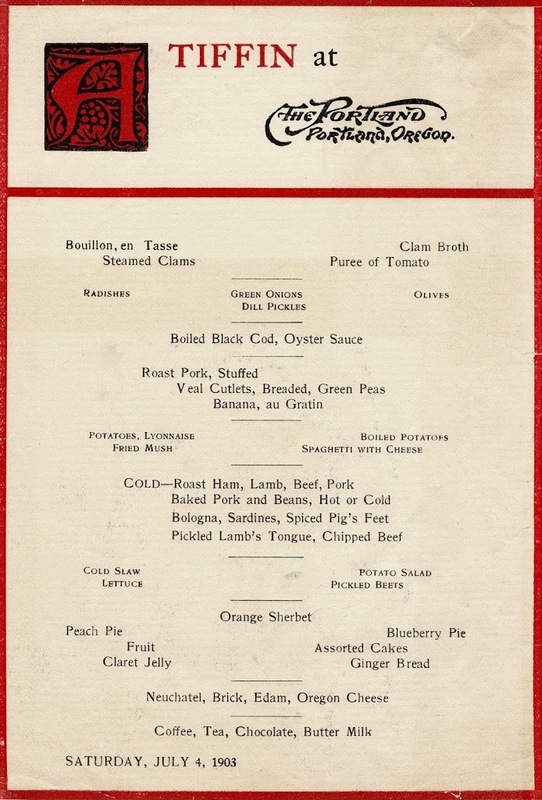 Here we have a menu for a meal at the famed Portland Hotel in 1904. What meal is it? Why, it’s A Tiffin! How very raj! Starting from the British slang term “tiffing,” for taking a drink, in the early nineteenth century it morphed into tiffin, to describe, in British India, a light lunch. It somehow reached our shores as a British-y word for lunch, even a fairly hefty lunch such as the one laid out for us in this menu. I’m all for bringing back claret jelly, too. « Oregon Prunes: for Health! So how would such a meal be served? as courses with very small portions? Did one get boiled (?!) blackcod AND roast pork AND a tray of cold meats or did one choose?